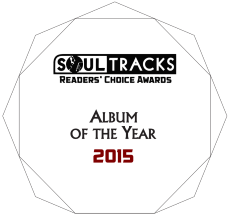 2015 SoulTracks Readers' Choice Awards Nominees Named! All ballots have now been mailed! The winners will be announced at our international broadcast on Monday, December 7. Alabama Shakes - "Color and Sound"
Kenny Lattimore - "Anatomy of A Love Song"
Lindsey Webster - "You Change"
Lizz Wright - "Freedom and Surrender"
Portia Monique - "Portia Monique"
Teedra Moses - "Cognac and Conversation"
Terri Lyne Carrington - "The Mosaic Project: Love and Soul"
The Foreign Exchange - "Tales from the Land of Milk and Honey"
The Internet - "Ego Death"
The Rebirth - "Being Through The Eyes of a Child"
Various Artists - "Bespeak Love"
Alabama Shakes - "Gimme All Your Love"
Bilal - "I Really Don't Care"
Brandon Williams feat Alex Isley and Moonchild - "Leave Love Be"
Brian Owens and Nao Yoshioka - "Love Love"
Jarrod Lawson - "When Will You Call"
Johnny Gill - "Game Changer"
Keith James - "Not My Day"
Martin Luther feat. Questlove - "Finally"
Meaghan Maples - "Feet On The Ground"
Phil Perry - "A Better Man"
Raheem DeVaughn - "When You Love Somebody"
Rogiérs - "I Found A Groove"
Teedra Moses and Anthony Hamilton - "That One"